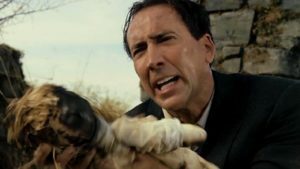 Maybe you’re familiar enough to know about “a shark or something?” Maybe you’ve only seen “oh no, not the bees!” Or perhaps you’ve lived blissfully ignorant of this 2006 remake of the 1973 mystery/thriller THE WICKER MAN starring Nicolas Cage. This movie is so entertaining on its own just to see the lead performance, but we’re going to add the jokes to ensure pure satisfaction. Cinemasochists’ What Happened series includes a presentation on the making of the chosen film, followed by a live riff performance in the tradition of MST3K. $5 cover, dinner and drinks served to your table from the Westport Flea Market menu. Movie and riff rated R.